ParkJockey cordially invites you to experience a night of art this Saturday, June 14 at Cafeina Wynwood Lounge. 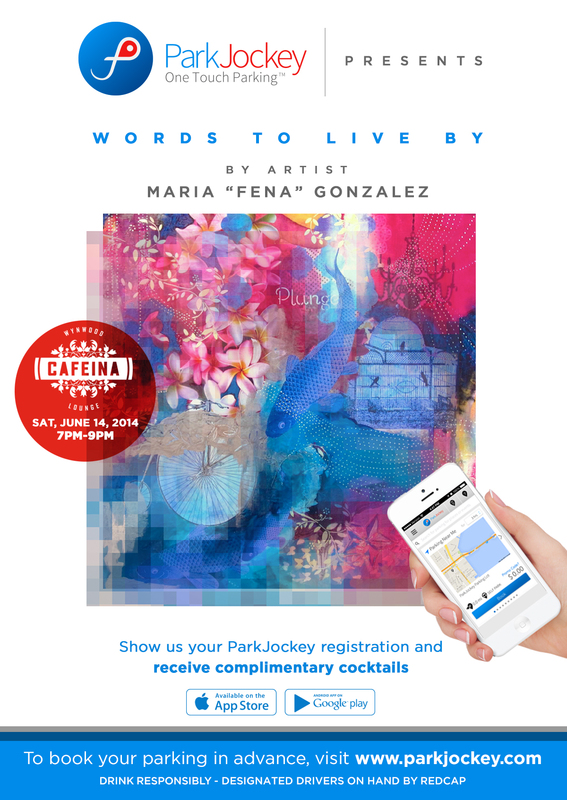 Guests will enjoy work by Maria “Fena” Gonzalez and those that display their ParkJockey registration on their phone will receive complimentary cocktails. “Words to Live By” is the artist’s introspective look into her favorite poetry intertwined with her own reflections on life, intentions and embracing it all. These works are presented as a whimsical dreamscape for viewers to lose themselves in. The festivities will take place between 7pm – 9pm. To secure your parking in advance, visit http://www.parkjockey.com/pjartwalk or search “Fena” within your ParkJockey app. All reservations are paid with a credit card, so there’s no need for cash or ATMs. The app and website are free to use and there are no extra fees associated with booking in advance. As always, please drink responsibly. Our partners, RedCap, can drive you home, or wherever else you would like to go, in your own car for less than the price of a round-trip taxi. Drivers are booked on a first-come, first-served basis so please book your personal driver early. See Also: Inaugural Wynwood Life Festival + FREE TICKETS courtesy of ParkJockey! This entry was posted in Miami, News, ParkJockey and tagged cafeina, Miami, wynwood art walk on June 12, 2014 by ParkJockey Team. A big thank you to both publications for helping spread the word! This entry was posted in Miami, News, ParkJockey, Press and tagged fashion, Miami, parking on May 15, 2014 by ParkJockey Team. BritWeek this year was a huge success for ParkJockey after we received the award for the “Innovation in Consumer Experience” during the prestigious Great Business Innovation Awards in Miami. This entry was posted in London, Miami, ParkJockey and tagged BritWeek, Miami, Miami Beach, Tech, UK, video on May 14, 2014 by ParkJockey Team. The wait is over. Our advert has arrived! A special mention goes to our production team for all the hard work they put into the video. All you existing and soon-to-become ParkJockey fans, sit back and enjoy “Hassle-free Parking”. This entry was posted in Chicago, London, Miami, News, ParkJockey, Press and tagged app, Cars, Chicago, Driving, London, Miami, mobile app, parking, parkjockey, social, video on May 13, 2014 by ParkJockey Team. Deco Drive shows some ParkJockey love! Louis Aguirre and Lynn Martinez are no strangers to the struggles of finding parking in Miami so last night they shared with their viewers a better way – PARKJOCKEY! Just as the White Hot Heat were taking on the Brooklyn Nets, Deco Drive highlighted ParkJockey’s ability to score you parking at the arena, in advance or on-the-go. This entry was posted in Chicago, Miami, News, ParkJockey, Press and tagged american airlines arena, deco drive, Miami, Miami Heat, parking, parkjockey, wsvn on May 9, 2014 by ParkJockey Team. The eMerge Americas conference wrapped up yesterday and we were so proud to have participated in its inaugural year. Yesterday our CEO, Umut Tekin, spoke on the Big City Mobility panel, highlighting how ParkJockey’s technology is helping users save time and money while improving the city’s traffic congestion. Umut also discussed how increased automation will drive the industry forward. We look forward to continuing our involvement in the tech community in Miami and abroad. This entry was posted in Chicago, Miami, News, ParkJockey, Press and tagged emerge americas, Miami, mobility, parking, techweek, Umut Tekin on May 7, 2014 by ParkJockey Team. Inaugural Wynwood Life Festival + FREE TICKETS courtesy of ParkJockey! Everything seems to be happening in Wynwood these days. Last week we brought you Wynwood Art Walk and this week we’re bringing you Wynwood Life! What started as a blog has morphed into a street festival celebrating all that makes Wynwood the vibrant neighborhood that it is. 20,000 attendees and over 100 vendors are expected to fill the streets off 6th Avenue to enjoy live art and music, all while indulging in delicious local fare from the various restaurants in the area. The festival takes place April 25th – 27th. ParkJockey is proud to be the official parking partner of Wynwood Life. So, don’t forget to book your parking in advance here. And wait, there’s more! The first 50 people to book their Wynwood Life parking with ParkJockey each get a FREE 2-DAY TICKET to the event – it doesn’t get much better than that!! Use ParkJockey now and get your ticket – as simple as that! This entry was posted in Miami, News, ParkJockey and tagged free tickets, Miami, parking, parkjockey, Wynwood, wynwood life, wynwood life free, wynwood life parking, wynwood life tickets on April 15, 2014 by ParkJockey Team. Wynwood Art Walk is a gallery walk that takes place on the second Saturday of every month in the Wynwood Art District of Miami. It’s a free event that’s open to the public, originally created to showcase galleries in the neighborhood. Some of the must see galleries include Pan American Art Projects, Robert Fontaine Gallery and NOW contemporary. Insider tip – come hungry! The neighborhood boasts delicious restaurants but nothing beats checking out the extensive choices at the various food trucks that setup for the night. Some favs are Dim Ssäm à gogo (by the people who brought you Sakaya Kitchen), gastroPod, Ms. Cheezious, Latin Burger and Taco, and HipPOPS for dessert! Art lovers start trickling in starting around 7pm, with a large crowd forming by 8pm. Parking can be tough to come by but that’s why you have ParkJockey! You can book your parking in advance here. This entry was posted in Miami, ParkJockey and tagged Arts, ArtWalk, Miami, parking, Wynwood on April 9, 2014 by ParkJockey Team. What a crazy time to be in Miami! Winter Music Conference is in full swing, with parties taking place across South Beach, Brickell and Downtown. Miami Music Week, now in it’s third year, kicked off on Tuesday but it’s tonight’s event that stands out against the rest. Remembrance, taking place at the Ice Palace in North Miami, aims to raise money for cancer research and to commemorate the life of Bingo Players’ Paul Baümer, who lost his battle with cancer in December 2013. Baümer’s former partner, Maarten Hoogstraten, will be performing, along with Dada Life, Tommy Trash, Henry Fong, MAKJ, just to mention a few. Then of course there’s the party to end all parties – Ultra Music Festival. Starting tomorrow at 4pm and going through Sunday at 11pm, this year’s festival promises not to disappoint, with performances by David Guetta, Afrojack, Avicii, and many more. Parking won’t be easy to come by, but ParkJockey has you covered! You can purchase a guaranteed spot for one to three days by visiting here. Use PROMO CODE “ULTRA” to get 10% off from the standard rate. See Also: Ultra Festival Parking Passes Now Available! This entry was posted in Miami, ParkJockey and tagged Brickell, Miami, parking, social, South Beach, Ultra Music Festival on March 27, 2014 by ParkJockey Team.